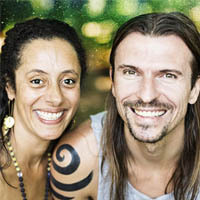 Tomek Soltron Czartoryski and Abby DelSol have been together for over 8 years, and for over 20 years individually, they travel the world offering an unusual concert experience consisting in creating sounds using instruments from different places and cultures of our Earth. They use specially made powerful Element Gongs up to 150cm / 60 “for them. They discovered that one of the ways to stay attentive and connected with yourself is Sound and its properties that are healing at all levels: mental, emotional and physical. They called this method, which they practice and share with others – Sacred Sound Ceremony.